Vkworld Mix 3 has been quietly introduced by the company as the successor to the Mix 2 smartphone that trended on shopping stores. The Mix 3 is already available for pre-order on some online store, including Banggood. 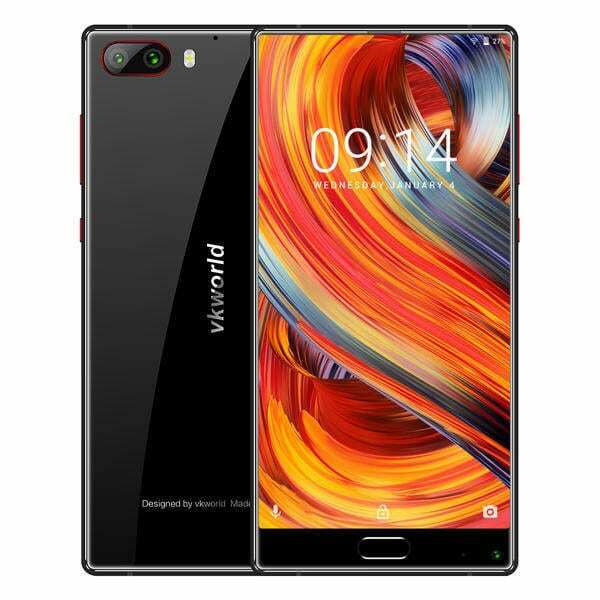 Vkworld went straight to the Mix 3 instead of going the Xiaomi way of introducing a “2S”. Vkworld Mix 3 has 6GB RAM, 128GB storage space, the trending Face ID and 4800mAh Battery. Without further ado, meet the Vkworld Mix 3. 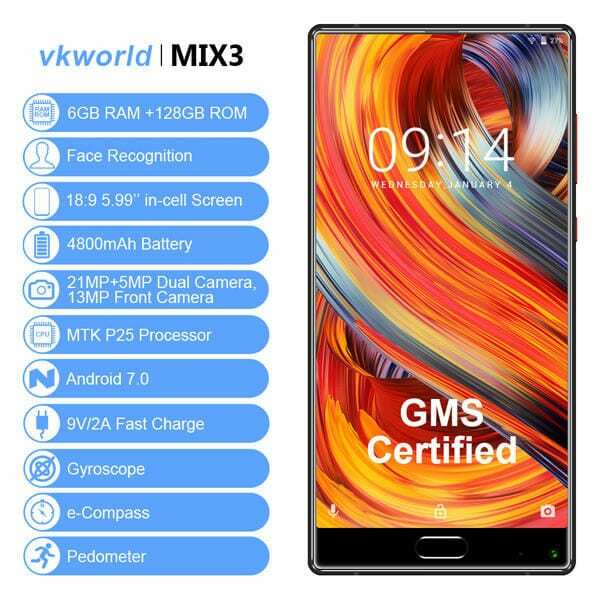 What is Vkworld Mix 3 Price and Availability Status? The Mix 3 is a beauty to behold no doubt, made from Metal and covered exquisitely in Glass. If you’re into Mix series, then you would acknowledge the beauty that is the Mix 3 here. The highlight of the rear is the dual shooters which are in a horizontal position at the top left corner. Vkworld ditched the trending iPhone X-like shooters seen on the Xiaomi Mi Mix 2S. It measures 9.2mm in thickness which can be attributed to the battery and the fact that it’s a Mix smartphone. It can be pre-ordered in Blue and Black colors only, even though a Red would have done more justice. The Mix series from smartphone companies in China are known for their bezel-less and tri-bezel-less displays. The Mix 3 continues the trend, but it seems they didn’t want to get rid of the physical home button which doubles as the fingerprint scanner. The selfie camera still sits at the bottom bezel to the right. This massive 5.99-inch FHD+ IPS LCD capacitive touchscreen is better than ever. Boasting of 2160 x 1080 pixels in resolution and 403 pixel per inch density for stunning and clear visuals. The screen stretches up to 77.22% screen to body ratio, while the Corning Gorilla Glass 4 protects it all. The MediaTek Helio P25 MT6757CD chip reigns supreme here with Octa-core processor and 64-bit CPU architecture. The 8-cores of processor here reaches a max speed of 2.39GHz with 16nm process technology for fast performance. Handling graphics is the ARM Mali-T880 MP2 graphics processor with 4-Cores and clocking at 900MHz. Launch all your favorite apps and heavy games and multitask through them all with 6GB RAM that has a memory speed of 1.6GHz. Want to store so many games? Well, a 128GB storage space is available and you can upgrade up to 256GB as well. The Vkworld Mix 3 runs on an older Android 7.0 Nougat operating system though. Sitting at the top left corner is a 21MP + 5MP shooter, which will work together to capture photographs with 5344 x 4016 pixels in dimension. There’s a dual-LED flash for night photography, while videos of 1080p are recorded at 30 frames per second. The 13MP selfie might not be in the most flattering position, but it takes cute selfies. Powering the Vkworld Mix 3 is a 4800mAh non-removable Li-Po battery with fast charging technology. With the fast charging feature, it shouldn’t take up to 2.2 hours to fully charge up the battery from 0% to 100%. The Vkworld Mix 3 is available on Shopping stores from $299 (N100,000) to $349 (N125,000). Click on the links above to view the latest Vkworld Mix 3 price & availability on Shopping stores.